Powers/Abilities: The Crusher possesses great strength (Class 25-75) and durability, with an especially strong grip. He likely is immune to the effects of disease and/or aging. (Thor I#130) - Thor battled the forces of Pluto, in an effort to free Hercules from his thrall. 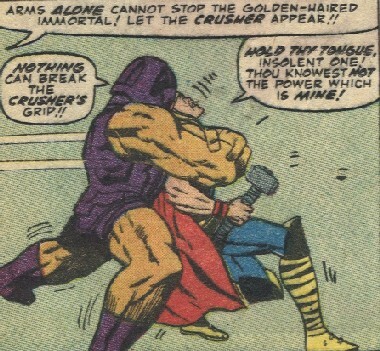 Pluto sent the Crusher against Thor, and though none had broken the Crusher's grasp before, Thor broke free and hurled the Crusher away. Soon after, Pluto conceded defeat to prevent Thor from shattering Hades in the course of the battle. Pluto has a number of "mutates" who serve him. As Pluto is the lord of the underworld of Hades, it would make the most sense that these are the spirits of the dead, mutated and manipulated by him. He could even be fashioning false, ectoplasmic or other inorganic bodies for these spirits. However, as far as I know, the origins of these mutates has never been revealed. Will U suggests that the Crusher could be Antaeus, the son of Poseidon who \par recieved his strength from contact with his mother, Gaea. Hercules defeated him by lifting him into the air and then crushing the breath out of him so he'd definitely be a ghost by now. True, but he also COULD be anyone else, as well. There's no evidence to link him to anyone. All we know is he was a big, strong guy under Pluto's control. 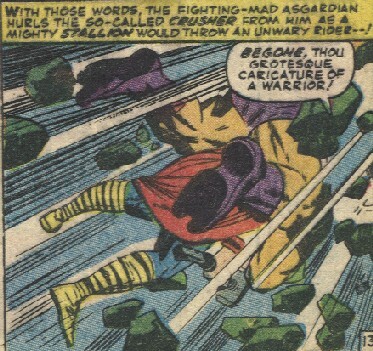 Hercules' adventure with Antaeus was shown in flashback in Avengers I#265.